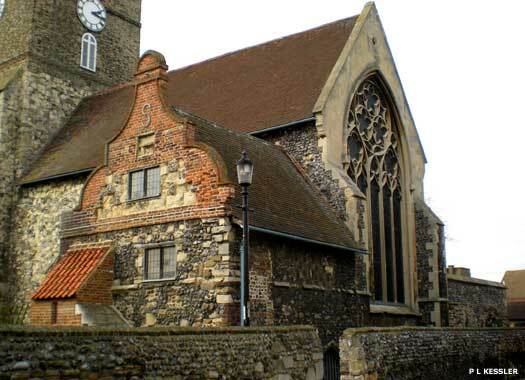 St Clement's Church is on Knightrider Street in Sandwich, to the south of the junction with Sandown Road. 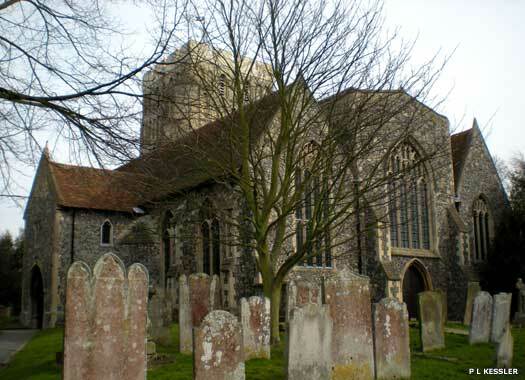 The town contains three churches which gave their names to the old parishes, and Sandwich remained divided into three parishes until comparatively recently. 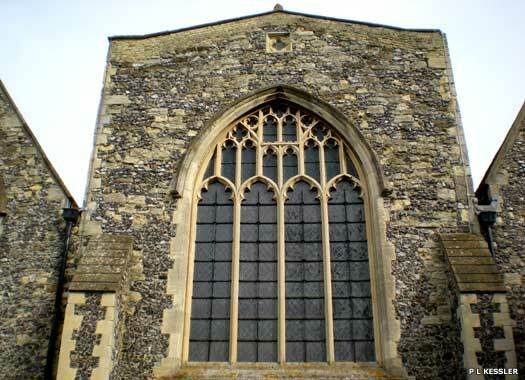 Adjoining the town's ramparts, the church was originally built in a characteristically Norman cruciform plan in the twelfth century when Sandwich was becoming a royal harbour of some importance. The church was aisless, but with the massive stone central tower and the east and west part of the nave. The tower is one of the finest in England - the pillars which support it have rounded arches and curiously carved capitals with various ornamentations of scrolls, frets, foliage and grotesque figures. 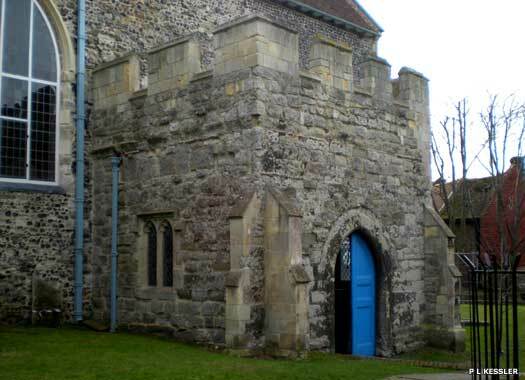 In the thirteenth century the chancel was rebuilt with a north chapel using flint and sandstone, and some Caen stone, and in the fourteenth century a south chapel was added. The St Margaret and St George chapels between them contain a complete medieval tiled floor, and a statue of St John taken from Lincoln Cathedral by the Puritans. The spire and defensive battlements were taken down between 1670-1673, and the nineteenth century Dutch residents were allowed to perform divine service here on the payment of forty shillings a year. 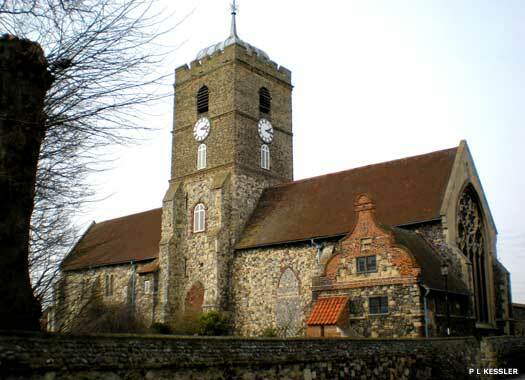 The town's three parishes were united in 1948, and St Clement's became the single parish church. St Peter's Church lies on the street of the same name, with King Street on the far side. The Domesday book makes no mention of it but a Saxon building probably existed here, to be replaced by a Norman building in stone. The earliest stones in St Peter's (at the west end of the nave) probably date from shortly after the Norman conquest. This church was probably destroyed in the fighting of 1217 when Sandwich was attacked and severely damaged by the French. The church was rebuilt, and it is this thirteenth century work that forms the core of the present church, traditionally held to have been the work of the Carmelite 'White Friars' from France. It had a wider nave, a tower and a chancel and two aisles on either side, narrower and lower than the present north aisle. The interior windows above the arches at the west end of the nave originally looked out over the roof. 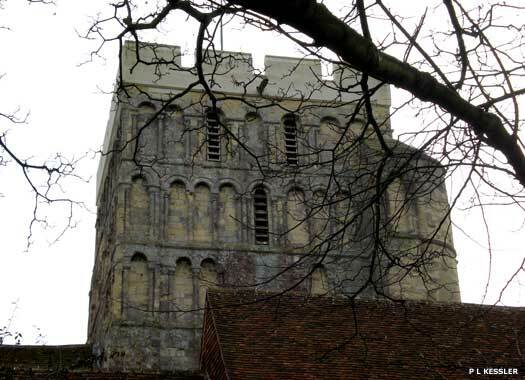 In the fourteenth century the north aisle was rebuilt. In 1564 there was a severe plague, and St Peter's was given to the 'Strangers', Dutch Protestant émigrés, for their use to discourage the spread of infection. In 1661 the tower collapsed due to lack of maintenance. No one was hurt but the south aisle was buried, so the Flemish community rebuilt the tower. In 1779 a ring of eight bells was cast and a clock installed in the tower. 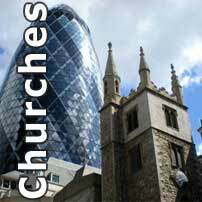 The church was declared redundant in 1948, and in 2009-2010 it underwent restoration work.